Sport—Mr. Eric Tomkins, of the Northampton Football Club, has commenced practicing cricket with the Northamptonshire Club and Ground with a view to assisting the county. An early trial may be expected. Eric Tomkins, while based at RFC Netheravon, guested for Southampton in WWI. Association Football—Eric Tomkins, of Rushden, has been re-engaged as a member of the Northampton Football Team. In 1907 Mr. Eric F. Tomkins (72), “Llanberis,” 3 Midland Road, Rushden, represented the England schoolboys against Wales in the first ever schoolboy international. Mr. Tomkins’ selection for the schoolboy XI was the advent of a great footballing career. Mr. Tomkins played for the Cobblers between 1911-1915 and 1919-1928. During the First World War he was a guest player for Southampton and Spurs and was an inter-service international. He represented the RAF at both football and cricket. He was the English FA’s chief coach for Northamptonshire and Bedfordshire from 1933-1939 and 1946-47. He also played cricket and hockey for Northamptonshire. F Clipston, E F C Tomkins. Eric Felton Tomkins was the son of Rev William Tomkins, the minister of Rushden Baptist Chapel. 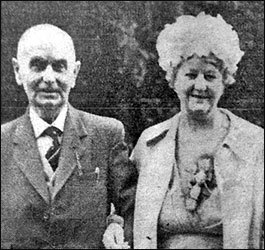 He was orphaned when he was 10 years old and a Sunday School teacher from his church, Miss Alice Williams, became his guardian in 1902. His first big break in sport came in 1907 when he was selected to play for England Schoolboys at under 14 level. Eric was signed for the Cobblers in 1911 and, as you know, Walter lodged with him in Queen Street, Rushden. 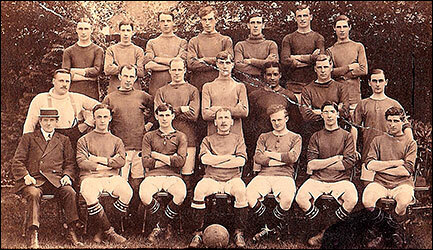 The outbreak of the Great War interrupted their professional football careers. Eric joined the Royal Flying Corps. He continued playing football during the war and went on to represent the RFC and ‘guested’ for Tottenham Hotspur in a wartime game. Over the course of his career he was capped for England’s soccer and cricket sides and played for Cobblers and Southampton before becoming manager/coach of Notts County just before World War II. In later life he became a FA coach for 150 schools in Northamptonshire and 130 schools in Bedfordshire. His caption: "The Best Match of All"
Eric Tomkins’ sporting achievements were not confined to the game of football. He also represented Northamptonshire in both cricket and hockey. Eric’s nickname was ‘Wassie’, which I understand was down to his sharpness in appealing to umpires for a wicket (‘How was he?’)! Eric married my biological maternal grandmother, (a widow), in 1963, when he was 70 years old. The entry in his scrapbook for this event is labelled ‘The Best Match of All’, which I find very touching. Sadly, my grandmother died before I was born in 1968, but I do remember Eric’s visits during my childhood. I can confirm that his devotion and enthusiasm to sport never ceased and I have fond memories of him trying to teach me to dribble a football around the garden, unsuccessfully! He died in 1980 aged 87.